My Upton dress party dress project is thisclose to finished! I installed the zipper and finished the back seams last night. All that’s left is two hems, hand stitching the lining’s waistline down, and adding a hook and eye to the top of the zipper opening. Here’s a preview of the finished dress, which I’ve dubbed the Night-blooming Garden Dress. The color rendering in my sewing room is strange because the walls are lime-juice green. For the past few days, I’ve been working on the surface design for my Cashmerette Upton dress, the one I’ll be wearing to a friend’s wedding in a couple weeks. At first I thought I could use the technique I call “shattered lace”–which is basically printing through lace with liquid dye. I really love the effect on a silk scarf I made during my work group’s holiday crafting party a few years ago. (Yeah, we do that kind of fun thing.) I want to do more of this. It would look great on a dress! This silk habotai scarf was printed by spraying liquid dye through scraps of lace. I call the effect it creates “shattered lace” because that’s what it looks like to me. Just not this one. I realized that this technique probably wouldn’t take well on shantung, or at least not as well as on habotai. So I purchased some pretty stencils, a large rubber stamp, and a set of Jacquard Lumiere and Textile paints, and tested out the effects on scraps of my silk shantung. I settled on one stencil and the stamp and started by printing the dress bodice sections. If it turned out horrible, I had enough leftover fabric to cut new bodice pieces. I cut the bodice sections from the fabric, pinned them to large sheets of paper to keep them stable, covered my dining room table with a huge plastic drop cloth, and got to work! My fabric, before cutting and printing. I wasn’t sure at first whether I liked the effect, but it grew on me pretty quickly. Especially as I added metallic gold and metallic purple accents to the black print to give it more dimension. The design is very random and has kind of a hodgepodge appearance because of the branches with flowers and birds and then the large scattered blossoms of a different variety that in no way relate to the branches. This is the effect I would have wanted with the lace printing technique. I like the design a little more every time I look at it. I really like how these back sections now seem to glow. That’s the splotchy dye-job, but now it almost looks like an intentional part of the surface design. And just yesterday I realized that even if I had used the lace printing technique, there are no metallic liquid dyes. Duh. So I would have had to use some form of hand painting or printing/stamping anyway to do the metallic accents. Sigh. What a happy accident! Jacquard’s textile paints are great because they don’t spread willly nilly (unless you’re using DyNaFlow), and they heat set very easily with a hot iron. Once a painted design is heat-set, the fabric is washable. This dress won’t be washed often, though, as it will remain a semi-special occasion garment. Now that the bodice sections are done, I’m starting to work on the 4 skirt sections. Another view of the right skirt back (upside down) with the two back waistbands. What to make for a friend’s wedding?? I just realized it’s August. Funny how that happens. The months roll by, you think you have enough time for all the projects on your plate, and BOOM! It’s all gone. This finally hit me today because in just a bit over a month, a friend of mine is getting married and I can’t decide what to make to wear. I’ve got a 2-year-old UFO that’s all underlined and pleated and ready to be sewn together that I could finish. The fabric is a beautiful mulberry-colored metallic jacquard I picked up from the Haberman Fabrics booth at American Sewing Expo three or four years ago. 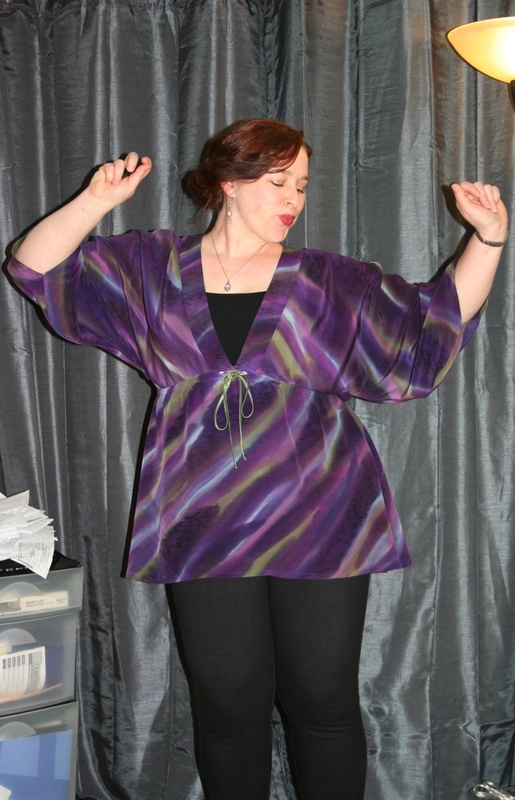 The pattern is from an issue of BurdaStyle magazine from 2011. I still love the fabric, I still love the dress, and as it’s ready for assembly it would be easy to finish. But I’m not sure it hits the right note for an early September wedding and reception in a rustic barn in Connecticut at 3 p.m. I could change plans pretty easily at this point and instead make the Cashmerette Upton dress with the full pleated skirt option. If past experience with Cashmerette’s patterns carries through to this one, most of my pattern alterations are already included in the pattern’s draft. I’d have to do a muslin, of course, and I’d have to pick a fabric. I have lots in my stash to choose from, but half my stash is now at my parents’ house 8 hours away, as I’m prepping for a move. What I do have on-hand is mostly casual, or intended for historical costume, or fancier but not enough yardage. A beautiful fuchsia jacquard-weave linen, which I’ve already planned to make into this dress anyway. I’ve got a solid 4 yards of this. The color looks a little hot in this photo, but it’s not far off the real color. There’s a large Art Nouveau-ish design woven into the fabric, and the linen has a beautiful hand, stiff body, and full drape, plus that lovely linen luminescence. I’d wash this by dunking it a few times in warm water and letting it air dry before pressing to preserve some of its crispness and the fiber’s natural glow. A silk shantung that started out periwinkle, but which I dyed to what I’ll call royal purple. Or maybe cornflower. It came out a tad splotchy in areas, but one more spin through the wash cleared most of that up. Still, the subtle sheen of shantung was diminished by the hot dye bath and washing it afterward. It definitely has a sand-washed appearance now. I have 3 yards of this 59-inch-wide fabric, which should be JUST enough for an Upton dress. I’d like to try a bit of painting on this one to disguise any remaining splotches, with black and gold paints. It would be semi-fancy, original, and just challenging and creative enough to keep my attention on it. Then there’s the 7+ yards of rose-gold silk dupioni that I bought for a Regency gown, but then decided it would be too stiff even after washing. It is very highly slubbed and medium weight. It would probably look great after a gentle wash with baby shampoo. Despite the texture and pretty color and nice sheen, it would be a rather plain dress. So I’d probably do some painting on it to give the dress more interest. What do you do when you’re faced with several good options and can’t decide which would be best? If there wasn’t a deadline involved I’d say: I’ll make them all and it doesn’t matter which one comes first. But since this is sewing for a goal, a dress to wear to a friend’s wedding, deciding is kind of important. Here’s what I do when I can’t decide: sketch. I either free-hand draw the design, then color it in to get the full effect, or I use the pattern flats. Since the Upton is a very simple design and the flats are already nicely proportioned for my kind of figure, I decided to use them as the basis for my sketches. Here’s option 2, from the royal/cornflower shantung. I would apply a painted design that I call “shattered lace,” which is done by dabbing fabric paint or spraying liquid dye onto the fabric through scraps of lace. I love this technique because it’s so interesting. I’d use black and gold and scatter the patterns around the fabric randomly. And option 3, which is hard to get an accurate sketch for because the color is hard to reproduce with marker (I did some color saturation adjustment). For this option, I’d also apply a shattered lace effect, but in gold and bronze color paints, and probably only concentrated around the dress’s hemline. I tried to mimic the dupioni texture with metallic gold pen, but the color adjustment reduced its effect. I really like all of these options, and making a decision is going to be tough. All the colors would look good with my complexion, I think. The linen is a fancy fabric, despite being made from a humble fiber, and it’s in one of my favorite colors. And it would require no additional embellishment. The royal/cornflower shantung offers a real creative opportunity and could be a very unique, beautiful dress. But the rose-gold dupioni also offers creativity, although it would be a more subtle paint-job. And the fabric is a bit fancier because of its sheen, maybe too fancy for the wedding time. I’m leaning towards the royal/cornflower shantung, because I like to make things hard on myself, apparently. But it wouldn’t take much time to accomplish the painting. However, I have a lot of projects on my plate at the moment: I’m helping another friend with her wedding dress (for October), I’m supposed to be whipping up my fitting muslin for the Chanel jacket to contribute to a project at work (in September), and I’m trying to get some blouses made AND pack my belongings. What would you do? Which would you wear to a 3 p.m. early September (read: potentially hot) wedding in a barn? I know there aren’t a lot of followers of this blog out there, and it’s not often I ask for opinions because I usually have pretty firm ones of my own–but if you would like to share yours, please do! Help me out, folks!